How do we make the education experience the best for our children? School - the place where we spend a lot of our time as youngesters and the place we make friends and build skills!! Teachers do a great job of modifying curriculum to best suit students. Here are some other resources that teachers may find helpful, as well as professionals supporting teachers. Information on Education is listed below. This is our blog explaining a Whole Class Approach to intervention! A great website with lots of paid and free resources available. Easy to navigate the thousands of resources. This website has 1000000+ free and priced teaching resources created by teachers for instant download including lesson plans, unit plans, novels. This is the link to our teachers page teachers page - but if you search with the "free" button. FREE - normally no more than $2-10 but does depend on what you purchase from them. How Do I Teach This Kid? 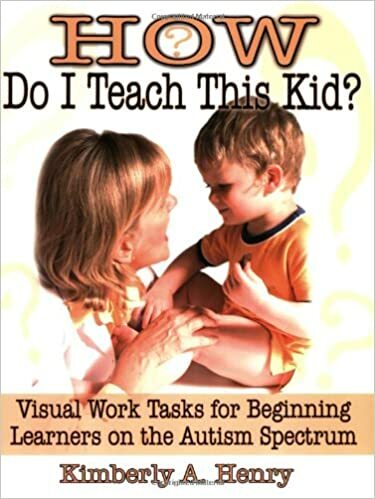 This series of books is designed to share ideas for using visual strategies to teach children with autism. The books provide practical, easy-to-implement ideas for creating work tasks or boxes to be used to teach students to work independently and for an established length of time. They contain classroom and home-tested ideas of addressing skills in six different areas: sorting, matching, reading, writing, mathematics, and motor tasks. This is a free site teaching the basics of reading. The site features interactive books and phonics games. Modern Teaching Aids supplies early childhood, primary and secondary school resources, teacher resources, school supplies, childcare supplies and classroom resources. The site includes an extensive range of art & craft materials, mathematics equipment, literacy resources, educational toys, furniture and storage solutions as well as books, readers, science equipment, puzzles, games and construction sets. Some items are more on the pricey end, however the quality is second to none and you know they will last FOREVER! Depends on what you purchase from them. This site is designed to make the lives of autism interventionists more productive and satisfying. Browse examples and printables for structured teaching and curriculum support. A great website with lots of paid and free resources available. Easy to navigate and thousands of resources. Some free items but works on a subscription basis. A great website with lots of paid and free resources available. They are "specific" to Autism, however lots of these resources work for all kids! Easy to navigate and thousands of resources. Link is to their resource page!! A great website with lots of ideas for activities that promote creativity and play! Loads of home schooling and holiday ideas that are great to help get that creativity flowing! !